Below you will find answers to the most common questions. If you still have questions, don't hesitate to reach out and talk with us. Do I need to attend on-site? No, this class is 100% virtual and there is no physical classroom where students "binge learn". We believe that learning and development should occur over time, practiced regularly in your own work environment and in a safe place where feedback is provided by expert coaches. We know that everyone learns differently. Each week we vary the learning pedagogy (e.g. delivery method) to maintain flexibility and hold learner interest. Modalities for this class include curated microlearning, eLearning, coached eLearning, and live virtual class. We offer enrollment in 4 Master Classes per year. We are currently enrolling students for the program. We can also set custom schedules for large groups. How large is the class? What is the instructor to student ratio? To maintain the level of individualized attention we provide in a Master Class, we limit enrollment to 16 individuals, which is 8 students per instructor. When are the live sessions held and how long are they? Not all sessions are live. But we do plan on holding the live sessions in the evening at a time that is the best fit for each class cohort and their respective time zones--typically in the evening between 7-9 PM. Live sessions are approximately 90 minutes and will be recorded and posted immediately to accommodate all learner schedules. What is the expected level of commitment each week? About tools: Learners who lack analytic tool experience or want to learn a new tool can expect to spend 3+ additional hours a week. Can I sign up for this course any time? Yes, you can enroll anytime through our online enrollment process. Please visit this page and click to enroll. For larger cohorts that wish to register for a special session, please speak with our program director. You can schedule a meeting here. What do you mean by “master class”? The Master Class tradition is rooted in the artist world where small, intimate groups would convene to learn specific skills and techniques from a Master with plentiful one-on-one coaching. Master Classes allow you to grow your ‘craft’ in a field and seeks to connect both the art and science of good teaching. This Master Class is intended to develop the competencies needed to story tell with data. The program occurs over a 12-week period and is divided into 9 learning units. 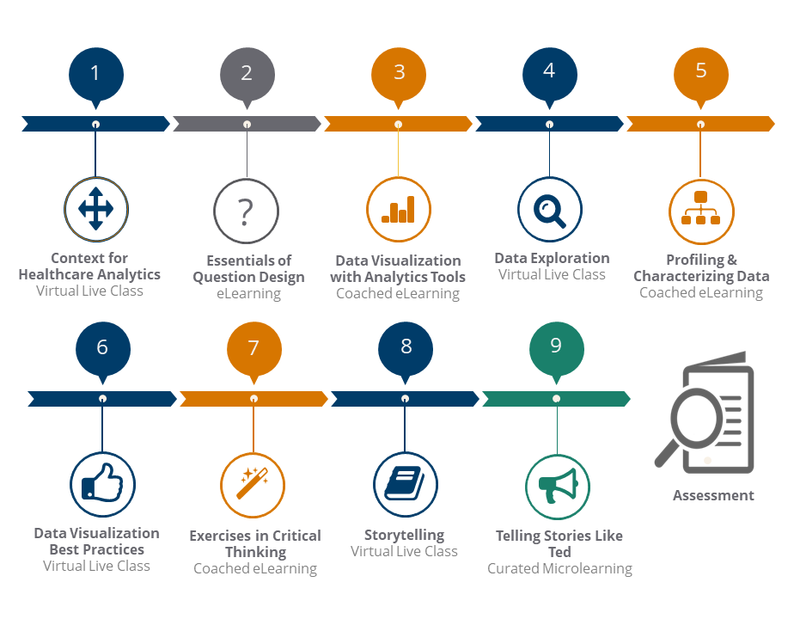 Throughout the program, you will be challenged to consider real-world scenarios in the areas of question design, data exploration, visualization, and learn practical skills for communicating analytic results that drive action. Our problem set assignments are meant to be open-ended and stimulate creativity and discussion. That said, we will show you in detail how we would have approached a given question. I am most comfortable using a specific analysis tool. Can I use this during the course? Absolutely! Tools come and go, but learning a structured approach to exploring and communicating data will sustain a career. Our lectures, activities, practice problems, and assignments can be conceived using most any tool. This allows learners to stick with the tool set available in their work environment as well as gain exposure to other tools that may pique their curiosity. You can customize the job aids and workflow templates for your organization. We hope that these will help you master your storytelling prowess! How is this course different from other analytics courses available online? While there are lots of online resources, very few focus on the precise set of competencies needed in Healthcare Analytics. This is not a traditional eLearning class. This is a Master Class! Our knowledge of the industry and our experience with analytics poises us to help solve the most challenging problems of healthcare. We understand that growing healthcare analytic competencies requires not just developing skills, but integrating them in unique ways to solve a business problem. Rigorous assignments with extensive instructor feedback aid in meaningful proficiency development. Binge learning doesn’t work. Many educational providers dump content on people in a short period of time, which is quickly forgotten. Our course blends the best of freely available online resources, our proprietary learning materials, and coaching to provide a balanced, practical, and ‘Thotful’ experience. Healthcare business data can be notoriously confusing, dirty, or otherwise imperfect. So why practice using clean data stripped of these realities? Our problem sets and assignments are crafted to include many of the typical idiosyncrasies one sees when on the job. Tools come and go, but learning a structured approach to exploring and communicating data will sustain a career. Our lectures, activities, practice problems, and assignments can be conceived using any tool. This allows learners to stick with the toolset available in their work environment as well as gain exposure to other tools that may pique their curiosity. Every resource, lecture, video, and problem set aligns to a competency we want you to develop. These competencies, and the learning objectives that map to them, are derived from the ThotWave Healthcare Analytics Competency Model. We developed this industry benchmark over many years of working with health analytic teams and mapping individual workflow to the healthcare analytic life cycle. Yes. We offer discounts for organizations with 10 or more employees.